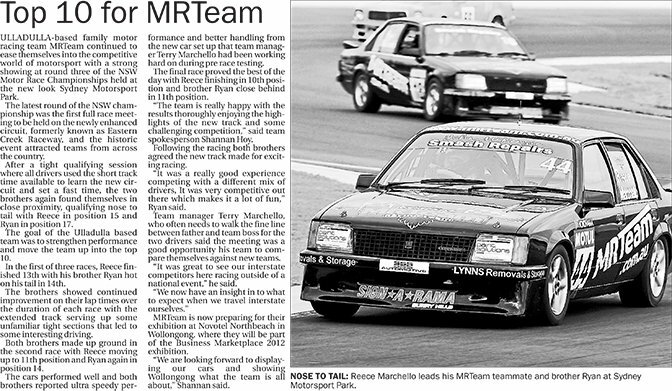 ULLADULLA-based family motor racing team MRTeam continued to ease themselves into the competitive world of motorsport with a strong showing at round three of the NSW Motor Race Championships held at the new look Sydney Motorsport Park. The latest round of the NSW championship was the first full race meeting to be held on the newly enhanced circuit, formerly known as Eastern Creek Raceway, and the historic event attracted teams from across the country. After a tight qualifying session where all drivers used the short track time available to learn the new circuit and set a fast time, the two brothers again found themselves in close proximity, qualifying nose to tail with Reece in position 15 and Ryan in position 17. The goal of the Ulladulla based team was to strengthen performance and move the team up into the top 10. In the first of three races, Reece finished 13th with his brother Ryan hot on his tail in 14th. The brothers showed continued improvement on their lap times over the duration of each race with the extended track serving up some unfamiliar tight sections that led to some interesting driving. Both brothers made up ground in the second race with Reece moving up to 11th position and Ryan again in position 14. The cars performed well and both brothers reported ultra speedy performance and better handling from the new car set up that team manager Terry Marchello had been working hard on during pre race testing. The final race proved the best of the day with Reece finishing in 10th position and brother Ryan close behind in 11th position. “The team is really happy with the results thoroughly enjoying the highlights of the new track and some challenging competition,” said team spokesperson Shannan Hoy. Following the racing both brothers agreed the new track made for exciting racing. “It was a really good experience competing with a different mix of drivers, It was very competitive out there which makes it a lot of fun,” Ryan said. Team manager Terry Marchello, who often needs to walk the fine line between father and team boss for the two drivers said the meeting was a good opportunity his team to compare themselves against new teams. “It was great to see our interstate competitors here racing outside of a national event,” he said. MRTeam is now preparing for their exhibition at Novotel Northbeach in Wollongong, where they will be part of the Business Marketplace 2012 exhibition. “We are looking forward to displaying our cars and showing Wollongong what the team is all about,” Shannan said.